It is important for construction projects to keep to their schedule and run a tightly-managed project to make sure that the end result is up to par and ready to be used by the stated time of delivery. At Affordable Insulation, we respect the importance of keeping a project moving on time and will be the dedicated project manager that any builder or contractor dreams of having. Working with Affordable Insulation means working with a company that will value your time, work with you, and communicate with you on the best solutions to any problems that may arise. Unlike any larger, non-local insulation companies, we provide a uniquely Tulsa-based project management solution that will tailor to a Tulsa builder or contractor’s way of doing things and will work with them using specific knowledge on what it is like to do new construction insulation in Tulsa. We will not keep our builders or contractors waiting while we work on “higher priority projects.” Each project is handled with the care and respect they deserve, and will be worked with professionally and with the knowledge of an experienced and local Tulsa project manager. 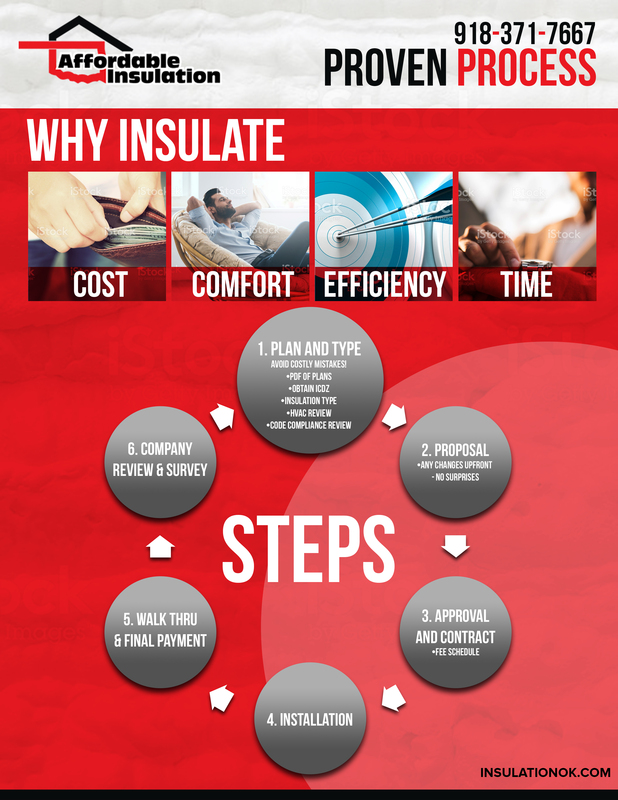 At Affordable Insulation, we do not believe in placing projects on a queue, to be worked on or temporarily ignored in terms of profitability or importance. If you work with Affordable Insulation, you will not have to twiddle your thumbs as you wait to install insulation, setting your construction project back. Every contractor or builder has the same priority to us, and that is top priority. It’s a sad inevitability that things go wrong or wrenches get thrown into the plans of any project. Construction is the same way. Whether heavy rainfall delays overall work or something more nefarious such as vandalism sets the crew back in damages, we will work with you and will prove flexible in adjusting to any schedule changes that you may need to make. There is no need to risk it with a larger company that would simply drop builders and contractors if they found their problems too much of a hassle. We don’t want to ignore the problems. We want to help solve them. If you want local, experienced Tulsa help that will put you first, call us today for a free, no-obligations estimate.